Today we explore with our readers acquainted with a new smartphone Samsung on which rumors started to circulate on the net already the first few weeks: the device in question is called Galaxy Y Pro Duos and on the Internet are already some photos of the device. The information on equipment technical product, at the time, but few are still worth to analyze it better. We’re talking about a pretty entry-level phone, which has nothing to do with the rest of the series as the Galaxy 2 and the Galaxy Notes. 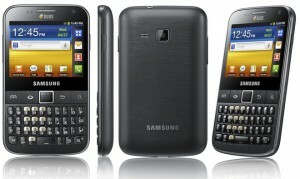 Its main feature is the presence of two SIM card slot on the back of the phone. For users, the convenience of being able to use two cards each day depending on your needs will be something wonderful. The smartphone has a physical QWERTY keyboard and is based on operating system Android 2.3 Gingerbread and the screen is 2.6 inches and has features touch with a screen resolution of 320 × 240 pixels LQVGA. The processor has a clock frequency of 832 Mhz, 348 Mb of RAM with an internal memory expandable up to 160 MB, as usual, via microSD. It should be also a camera with a resolution of 2 megapixels. As for connectivity, you have the more connections than the receiver GPS and A-GPS. Regarding the price, it seems that it will be approximately 159 euros. A telephone not great from a technical standpoint but certainly cost-effective while also taking into account the fact that it is dual SIM.